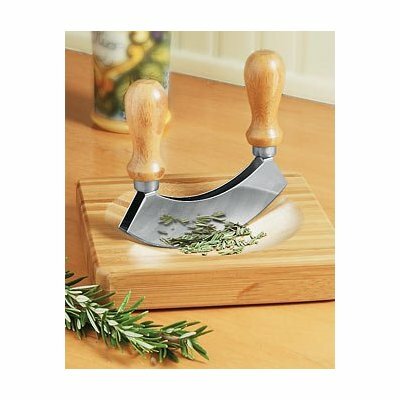 This double-handled mezzaluna has dual stainless steel blades and durable, eco-friendly wood handles. The double blades and ergonomic handles make chopping herbs, onions and nuts a breeze. Perfect for smaller chopping jobs. Great for herbs, onions, nuts and more. Double handle is easier on the hands. 6 inch size. Made in Italy. Click the button below to add the 6 Inch Double Blade Mezzaluna with Wooden Handles Made in Italy to your wish list.